SINGAPORE - A 38-year-old man was arrested after he caused a ruckus for several hours at the Changi Village hawker centre on Saturday evening (Jan 13). The man had also reportedly used the sharp edge of a nail clipper to injure two patrons, leaving droplets of blood splattered on the floor at the popular dinner spot. The police said they were alerted to the case of voluntarily causing hurt by a dangerous weapon at around 7.40pm. The attacker, who was believed to be drunk at the time, was arrested in relation to the case. The police said that a 30-year-old man was conscious when taken to the Changi General Hospital. The Straits Times understands that the other man had superficial injuries. The pair were believed to be buying a meal with their family members at the hawker centre, when they became unhappy with the man's unruly behaviour. Witnesses told Chinese-language newspaper Shin Min Daily News the man was seen walking unsteadily and harassing other patrons, including shouting loudly at them. A 28-year-old stall assistant, who wanted to be known only as Linda, claimed that the man had thrown plates at children, spit on the ground and stole food from patrons. The two men tried to help the man onto a seat, but to no avail. Later, as they were about to leave, they had reportedly told him to stop causing trouble at the hawker centre, but a fight soon erupted among the three. The attacker then took out a nail clipper, which he had with him, and lunged at the pair. Shin Min reported that one victim suffered deep cuts to his arm and the other had injuries to his thigh. 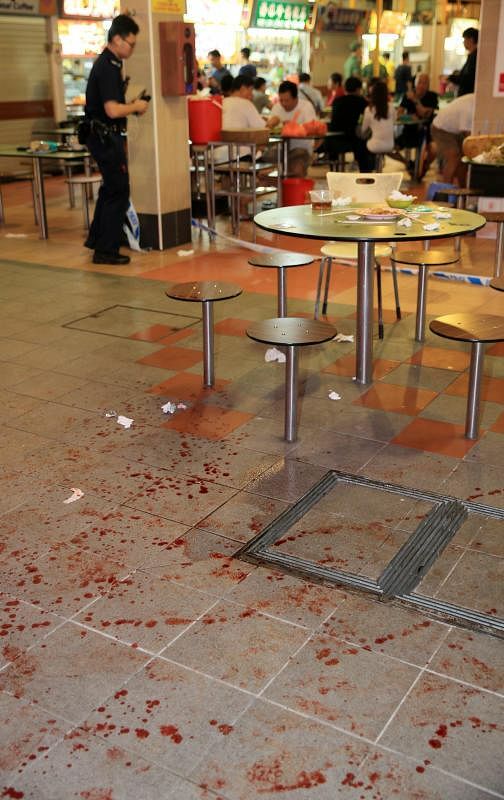 A 63-year-old stallholder, who wanted to be known as Mr Koh, said: "I saw that they were bleeding so much and that there was blood all over the floor, so I took some ice and cloth from my drinks stall to help stop the bleeding."